Esmeralda a few days after being found. 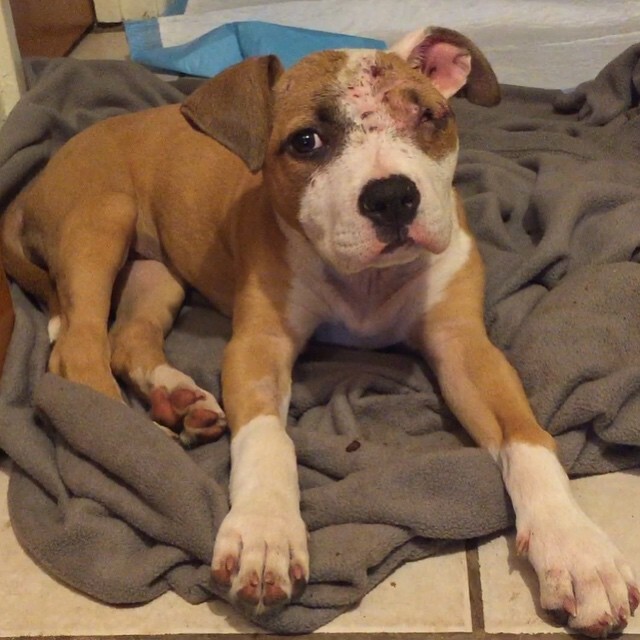 Baby Esmeralda was found as a stray with multiple bite wounds on her head and face, presumably by a larger dog. When she was found, she was unresponsive and in shock, unable to move or stand. At first, they really thought she'd have to be humanely euthanized because of how bad her condition was. Luckily, the amazing team at Abbey Vet Hospital was able to save this little sweetheart. Her skull is fractured in a couple spots, and her eye is still there; however, it is possible it will need to be removed (they are waiting on the swelling to go down a bit more before deciding whether the eye is okay to stay or if it needs to be removed). The chances of her being able to see out of the damaged eye is very very slim though- only time can tell right now. She'll have weekly vet visits with us, and we will keep everybody posted about her progress on our Instagram networks! Esmeralda a week or so after attack, in foster home, healing nicely! In the few days she has been with us, she has made it quite apparent that, despite her horrific previous encounter, she has NO fear of other dogs....or anything it seems! She's just like your typical puppy- spunky, mischevious, fun, and very impressionable. We are teaching her how to practice safe boundaries with her foster siblings and friends, and showing her what things to teethe on, and what things NOT to teethe on ;) Unfortunately, because of her injuries, she has to be monitored very carefully during play time, which we can tell is driving her little puppy self crazy! Don't let her injuries fool you..she WILL keep you on your toes! After some basic training and socialization, Esmeralda will be such a spunky addition to a very lucky family out there! Keep up with Esmeralda's progress by following her foster mommy, our co-owner, on Instagram here. 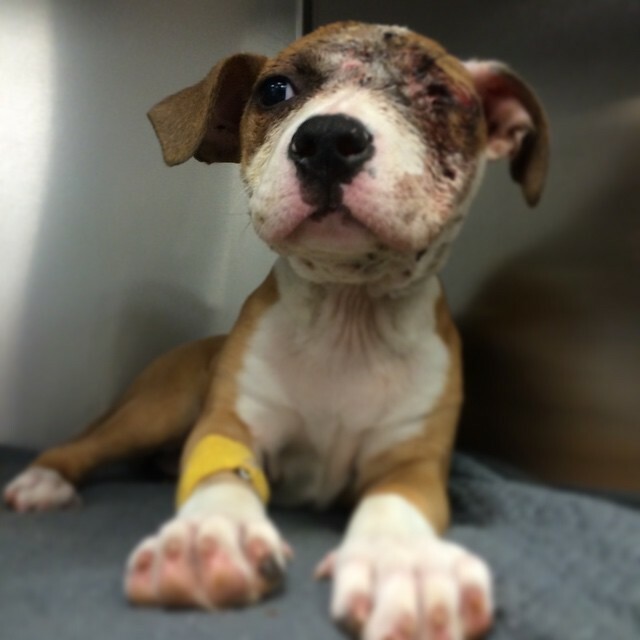 Look through Esmeralda's progress through her hashtag #oneeyedezzy here.